The ancient Indian sport of kabaddi is undergoing a revolution. For centuries it was only played on dusty fields in backcountry villages, but the launch of the Pro Kabaddi League in 2014 has transformed it from an antiquated pastime into a modern sporting spectacle on the Asian subcontinent, played in state-of-the-art stadiums and watched by hundreds of millions. The sport is growing so rapidly that the Kabaddi World Cup, which has been taking place this month in Ahmedabad, India, even features a team representing the United States. The Kabaddi World Cup has hoped to introduce the sport to a worldwide audience. Capitalizing on the success of the Pro Kabaddi League, the World Cup has featured 12 teams—India, Iran, Bangladesh, England, the United States, Australia, Japan, South Korea, Poland, Kenya, Argentina, and Thailand—and 33 matches en route to the final, which takes place tomorrow morning between pre-tournament favorites India and Iran. But outside of recently established PKL stars, like Anup Kumar, the captain of the Indian team, the quality of World Cup rosters thins out dramatically. Much of the tournament wasn’t even arranged until a few weeks before it kicked off, so many of the teams were hastily assembled and under-prepared. Most of the rosters are made up of part-timers, and often novices. The England team features a pharmacist, a dentist, and two med school students in its ranks. The Australian team is made up of mostly retired Aussie Rules football players. But no team has struck more curiosity than the United States contingent. Team USA’s roster was entirely unknown to the world until they stepped off the plane at the Patel International Airport on October 6th, only a day before their opening fixture against tournament heavyweights Iran. Most expected a hodge-podge unit of South Asian expats and aging journeymen, but instead they got 20 young, fit, black men, many sporting dreadlocks and tattoos, all bristling with energy. 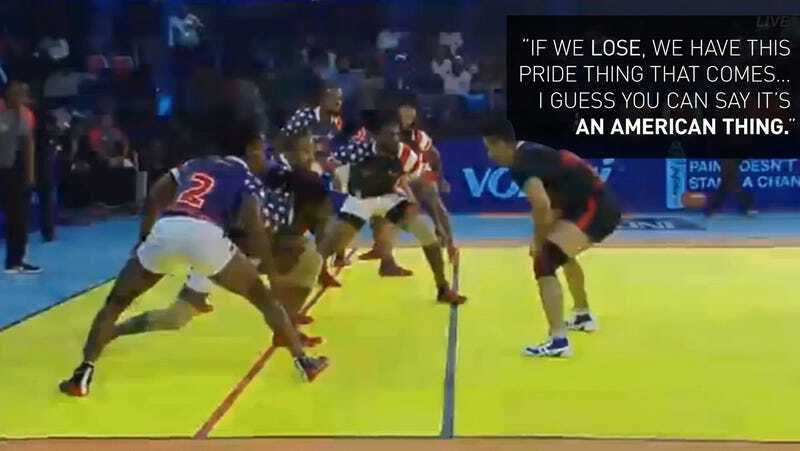 How this team of unknowns ended up in India playing at the brand new TransStadia arena against the best kabaddi players in the world is a tale of chance, opportunism, and a sight of what happens when a local game meets the global modern sports world. The opportunity came when Celestine Jones, an enterprising graduate of Florida A&M in Tallahassee, stumbled upon a chance meeting with PKL officials. They wanted her and boyfriend, team member Kevin Caldwell, to furnish a U.S. contingent for the World Cup. The only catch was that she had less than a month to do so. She didn’t even have time to think twice, and naturally tapped into her network in Florida. Through social media and word-of-mouth, a ragtag group of musicians, rappers, aspiring media entrepreneurs, bodybuilders, athletes, and fitness professionals answered the call, dropped everything and set out to Jacksonville for training. After less than a day to adjust to the culture shock of India, Team USA hit the mat against tournament favorites Iran and were totally outmatched, losing 52-15—a blowout. Their inexperience was plain to see, but so was their personality and presence. Troy Bacon aka Kushim Rey was the leader from the front, picking up multi-point “super raids” with his dreads flying through the air. Kevin Caldwell sharpied the word ‘HUSTLE’ on the back of his stars-and-stripes jersey. Ben Marcelus told Indian journalists that they should call him “BenTen.” The U.S. team’s official tournament photo shoot turned into a full-blown ruckus—a far cry from the austere atmosphere of the Indian team’s session. For a sport that was until recently only played by Indian villagers, the culture shock was a mutual experience. Although the results weren’t favorable, there are signs of encouragement for Team USA beyond just showing up. Battered and bruised, the team’s shape and sharpness increased with each game, capped by a memorable Banks raid in the final outing, during which he dragged damn near the whole Kenyan team back with him to stateside lines. In the same game Marcelus—with six stitches above his eye—aggressively battled through Kenyan lines to score a point. They kept composed and competed until the final whistle. Perhaps even more importantly, the United States team has established a modern origin story: Kabaddi is now a game played by Americans. When I make the inevitable connection and ask the team members if they’ve ever seen the 1993 movie Cool Runnings, in which an unlikely assortment represent Jamaica in bobsled at the Winter Olympics and come dead last, they all burst into laughter, talking over one another to drop one liners. They’ve all seen it. Anyone looking to pick up the movie rights to this story may want to consider Warm Raidings, although with as many self-professed media entrepreneurs as there are on the team, this story could well turn into a Tyler Perry vehicle before the next World Cup. There are rumors swirling among the media in Ahmedabad that there may be another edition of the Kabaddi World Cup as soon as next year. Tradition states that kabaddi originated in India over 4,000 years ago. The United States made it this far on just two weeks of practice. Imagine where they can go from here.